You Signed Up For What?! | Running long distances and training for triathlons while juggling working, traveling, and being a working mom of three little kids. Running long distances and training for triathlons while juggling working, traveling, and being a working mom of three little kids. Posted on January 7, 2014 by Cynthia @ You Signed Up For WHAT?! Hi – you’re seeing this message since you subscribe to my blog You Signed Up For WHAT? !, and for that – thank you! I’ve moved the blog to a “self-hosted” platform. If you come to the blog directly via the domain name www.yousignedupforwhat.com, you won’t notice a change, as that’s done through magically invisible technological wizardry. I’m told my subscribers will be moved over, but just to be sure, click here and check out the new site and subscribe! It’s 90% ready – I’m waiting on a brand new header to be created. But for now, you can enjoy my homemade Facebook header that I created with my mad PicMonkey skills. I hope you keep following along, I have lots of exciting things planned for 2014. Posted on January 3, 2014 by Cynthia @ You Signed Up For WHAT?! I haven’t made resolutions – [heck, I didn’t even do a proper 2013 wrap up so how could I handle resolutions?!] – but I have decided something about the new year: I’m going to pay it forward in 2014. 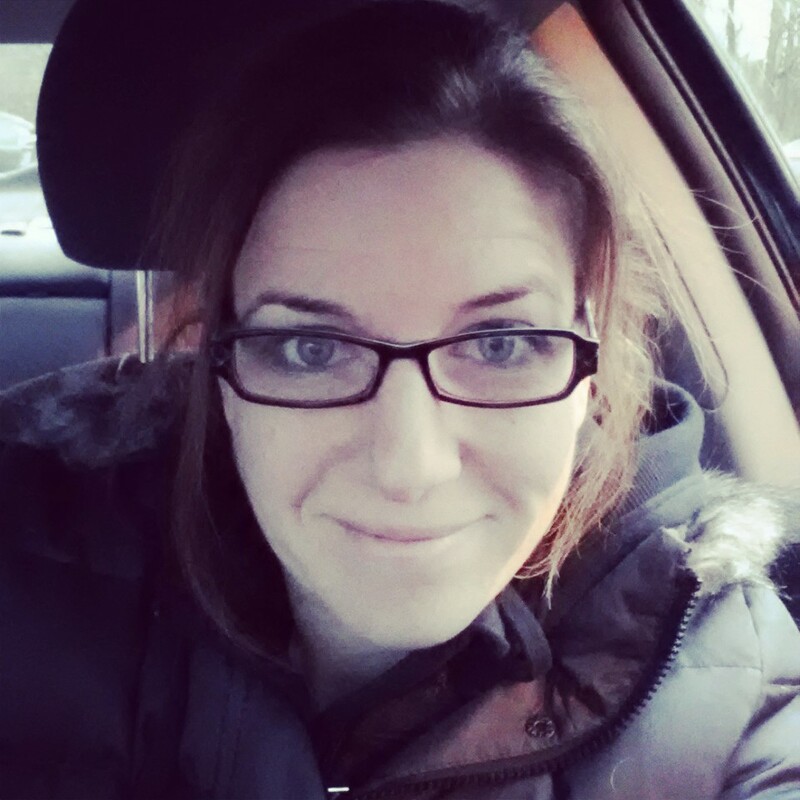 So for today’s Friday Five linkup with Courtney from Eat Pray Run, DC and Mar from Mar on the Run, I’m sharing Five Ways to Pay it Forward in 2014. 1. 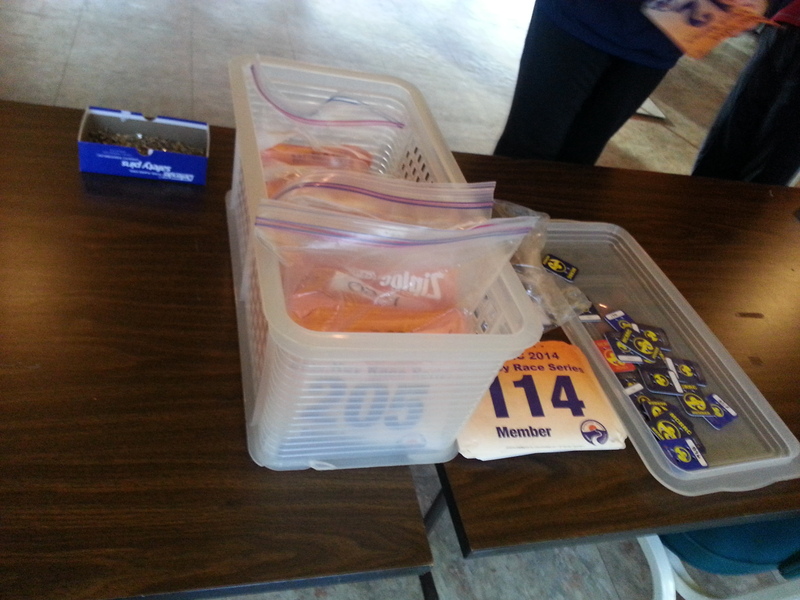 Volunteer at a race. I haven’t done much volunteering recently since my crazy schedule doesn’t leave me with a lot of “extra” time. If I’m out on a weekend morning instead of with my kids, it’s usually to do my own workout or a race. Since I’m benched from running because of surgery recovery, I decided to start the new year off right by volunteering at a New Year’s Day 5K. I figured if I can’t run during my recovery from surgery, I could give my time and be around a race again since I miss running so much. So at 7:30am on January 1, instant coffee in hand (ick), off I went in the freezing cold to volunteer. I worked registration, which was really fun. I liked seeing all the runners coming in excited for the race, bundled up in cold-weather running gear. Before I knew it, the speedy runners were finished with the 5K and I helped with the drink table (picture in the graphic above), and then helped with cleanup. I hope to volunteer at other races this year, and I think my daughter would also enjoy helping at some of these volunteer opportunities. 2. Donate old running shoes and clothes. If you’re like me and never bother to get rid of the old running shoes piling up in the closet, consider donating them! Many local running stores have shoe donation programs, and there are a few other online resources such as Soles4Souls and KindRunner that have different philosophies and methods. There are also local shelters and other common donation points for shoes and clothes. A shoe that may not be ideal for you to run a marathon in might still be an excellent piece of footwear for someone else. 3. Encourage youth to participate. I don’t know about you, but I love seeing my daughter’s face when she accomplishes something physical that she didn’t think she could do. She’s been playing soccer and is enjoying the running aspect of practices and games. Now she can ride her bike without training wheels, so she’s been talking about trying a kids’ fun run or youth duathlon. Another great way to encourage youth is by volunteering with Girls on the Run or another youth running organization. 4. Run a race for charity or donate! I ran the Marine Corps Marathon in 2007 for the Organization for Autism Research, and there are so many great and worthy causes. Sure, you can pay the straight race registration fee and run a race, but doing it through Team in Training or in support of another charitable organization is a wonderful way to make a difference through fitness. And if you have friends running for charity – support them! 5. Connect and share. 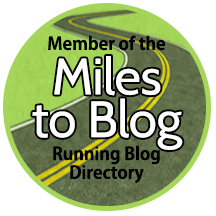 I know, runners and triathletes are competitive by nature, but there is also a huge bonus to this endeavor that is connecting with others, including helping new runners. Introduce yourself to a new person at a group run, welcome someone on the outskirts of a crowd, make others feel invited and welcome! Finding people with similar interests and passions as you is a great thing about the fitness community, and making newcomers feel welcome can spread your love of running and triathlon to others and give them the drive to stay active. And share what you know – your tips, your knowledge about running routes, and what works for you. 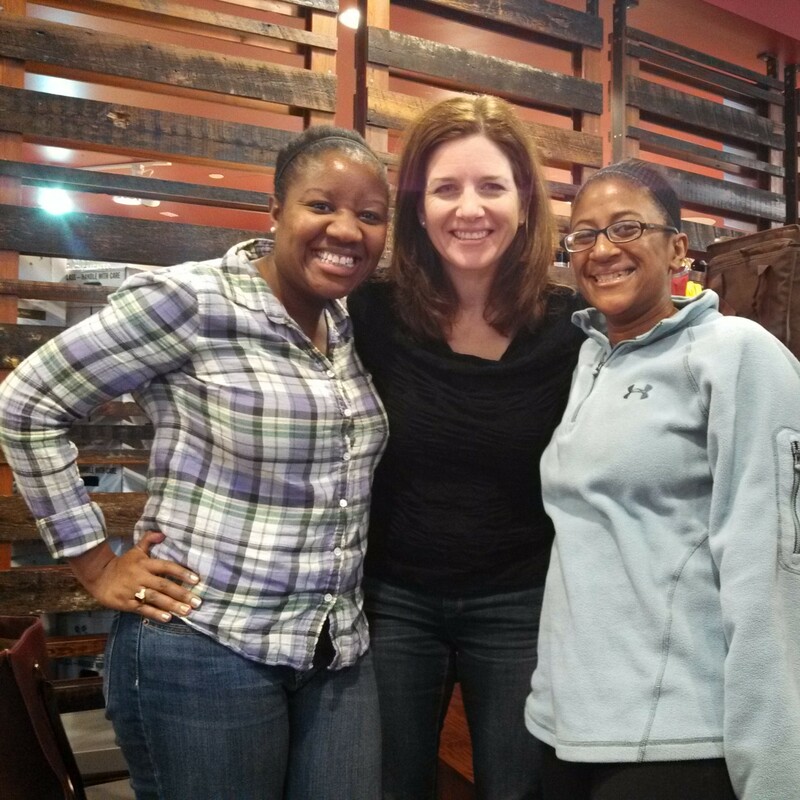 Speaking of connecting and sharing, on New Year’s Eve I had an awesome coffee/lunch with my two DC Trifecta linkup buddies Courtney and Mar! I’ve met Courtney a couple of times, but it was the first time I had met Mar! Next week, we’re going to have a themed Friday Five, so start thinking now on this topic: Your Five Favorite Motivational Sayings or Mantras, and link up with us to share the things that keep you going during a long run or a hard workout. 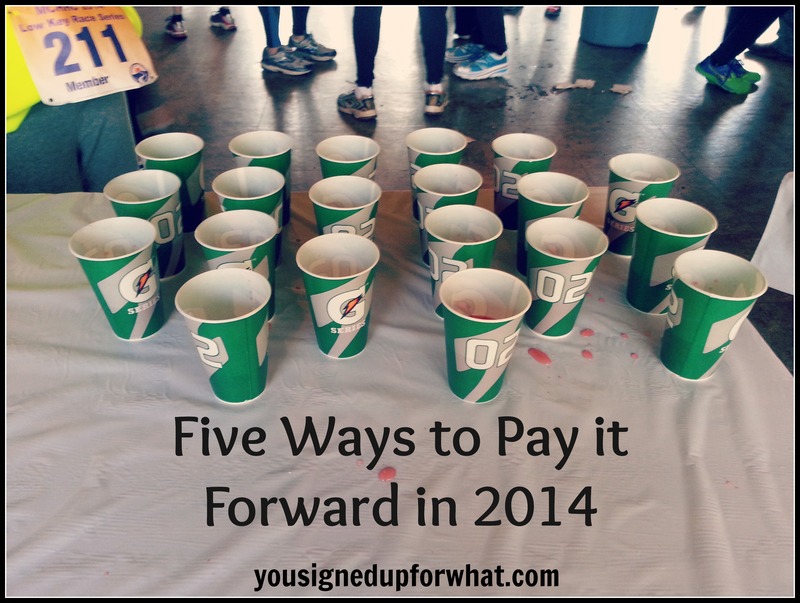 How can you pay it forward in 2014? Give me more ideas in the comments below! Posted on January 2, 2014 by Cynthia @ You Signed Up For WHAT?! I’d like to share two articles I wrote for the website SheKnows, which were just published. 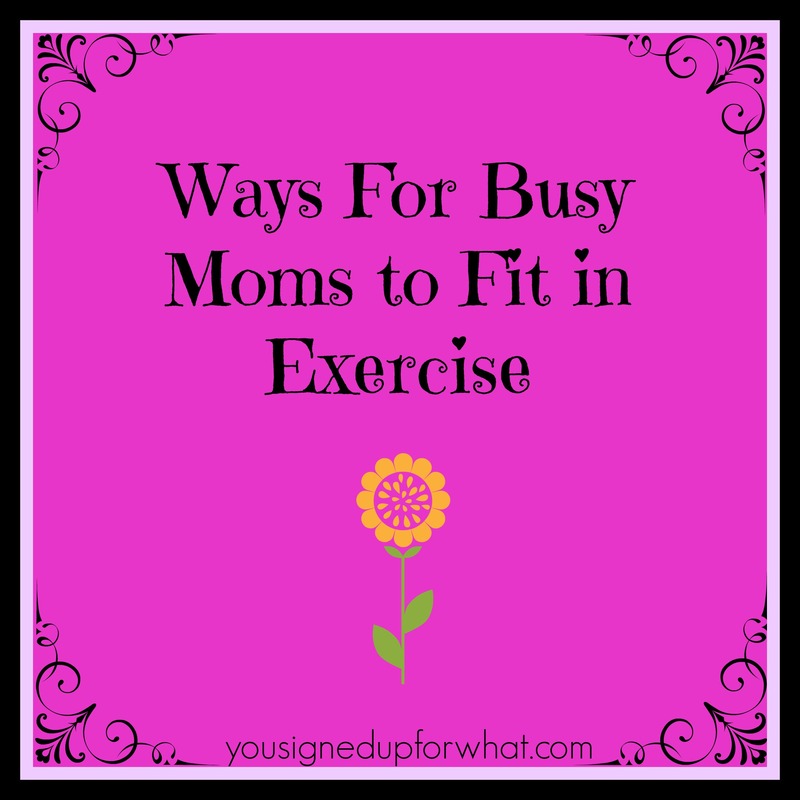 First is Easy Ways For Moms to Fit in Exercise, which includes several of my tips for running and exercising as a busy working mom of three little kids. I think that some of these strategies could come in handy for any busy person, not just moms. I am pretty sure I’ve posted about many of these before – 2013 taught me that creativity is key for fitting in the running and triathlon training! The second article is on Making Fitness Fun For The Whole Family. We’ve had so much fun being active this year and now my daughter is interested in the running and duathlon races that she has seen take place alongside my “grown-up” races. We’ve decided that she will be my new training buddy! So check out my two articles on SheKnows and let me know what you think! Also, thanks for your great comments on my This is Not a 2013 Wrap Up post. I realized later that I have done a lot of reflecting lately in my Friday Five Thankful post, and my What Was New in 2013 post, so it’s no wonder that I was all reflected-out by New Year’s Eve. I’m really excited for 2014 and all that this year will bring! What creative ways do you fit exercise into your busy schedule? What fun active things do you do with your kids? This Is Not a 2013 Wrap Up. Posted on December 31, 2013 by Cynthia @ You Signed Up For WHAT?! If you’re looking for a fancy wrap-up of 2013 or a reassessment of all my goals from the year, don’t read this. I know, I know, I should wrap it up, I should do my assessment, I should reflect and recoup and tie it all up with a string, kiss it goodbye, and wave to it as midnight approaches, so that I’m ready and open to what 2014 has in store. Why? Well, I’m freaking exhausted is why. I just spent several days in the hospital with the Young Mr. 2-year-old Sicklet, who had pneumonia and bronchiolitis and is still not breathing at 100%. We got home Sunday night and I went back to work Monday morning. I am confused about what day it is, we have no groceries, we still have unopened Christmas presents under the tree, and so… I’m Tired. Wait, don’t call me lazy or irreverent for not respecting the day – I know it’s freaking New Year’s Eve – I know it! But here is how things go when you’re mom to three, have a full-time job, and life keeps throwing curveballs at you. You let things slide, you triage, you figure out what’s important that day, that hour, that minute – and you get it done. And anything else? The “else” is extra. You see, I write as an outlet, I don’t write as a chore. I stared at this computer screen for a good 30 minutes last night and kept popping over to Facebook, looking up recipes, going through old photos. But you know what I didn’t do? I didn’t write a 2013 wrap up. I guess I’m “supposed to”, but I just wasn’t feeling it. I wasn’t inspired to do it. It felt like a chore. 1. I am not a machine. I can do it all, yes, I firmly believe that I can do it all. But I can’t do it all machine-like and robotic. I am human, I find joy and inspiration through writing this little blog o’mine, and I can’t add more to my plate just because of a date on the calendar. Same goes with work, the kids, running, triathlon training. I’m not a machine. I have to let the rope slide a little bit so that it doesn’t snap. The second thing that 2013 has taught me? 2. Find your passion. Figure out who YOU want to be, what you want to do, what inspires you and gets you up in the morning eager to start the day. And then figure out how you can get there, what it would take to be that person. And then do it. Sounds easy? It’s not. But you can do it. I did it – I’m sitting here on New Year’s Eve thinking about 1 year ago today, and what a difference one year can make. So many things have happened this year, from successes to challenges. But I found my passion, my inspiration, and life is exciting and fun and I’m happy to get up in the morning and tackle it all. And now… on to 2014. How was your 2013? What is one thing you want to conquer in 2014? Posted on December 27, 2013 by Cynthia @ You Signed Up For WHAT?! Merry Christmas from my silly kids to you! And if you don’t celebrate Christmas, General-Good-Vibes at this time of year! Not pictured above is my youngest who is sick this week. If you saw my brief “Stay Tuned” post earlier today that I posted from my phone, you’ll see why I’m a bit late getting my Friday Five post up this week. In short: after 10 hours in the ER last night, he was admitted to the hospital. He has a touch of pneumonia and respiratory distress – coughing, wheezing, chest retracting when he’s breathing. He’s going to be okay, he always has breathing issues when he gets sick, but it was pretty bad and they almost transferred us somewhere with a pediatric ICU. I think he’s improving a bit but he’s still on the nebulizer every 2 hours in the hospital. The poor little guy didn’t even notice what Santa brought this year. 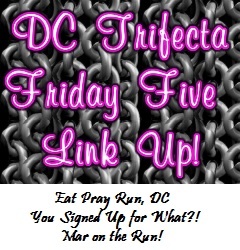 Anyhow, the linkup with Courtney at Eat Pray Run, DC and Mar at Mar on the Run continues on into 2014 so please link up below and check out the other blogs! I thought I’d highlight five new things I did or tried in 2013 that were new. 1. Travel to new places. 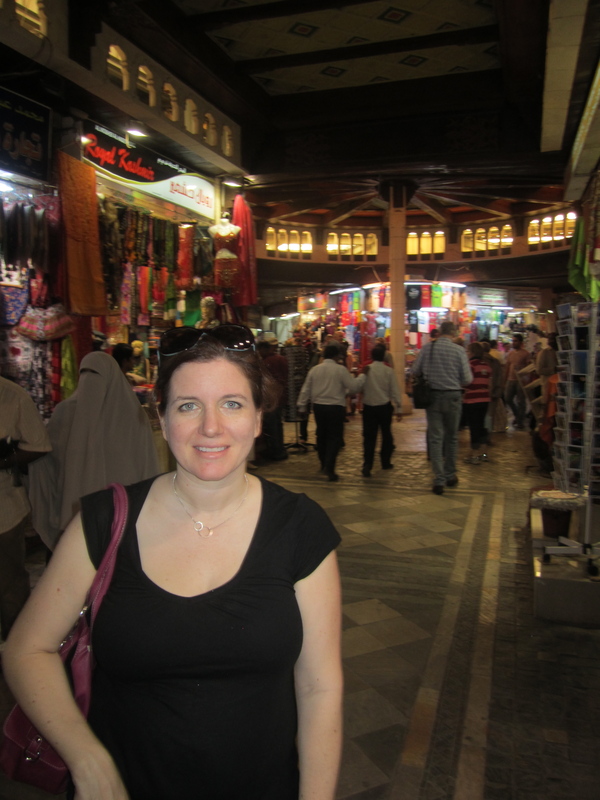 In January-February, I had a work trip to Europe, which included some new places for me. 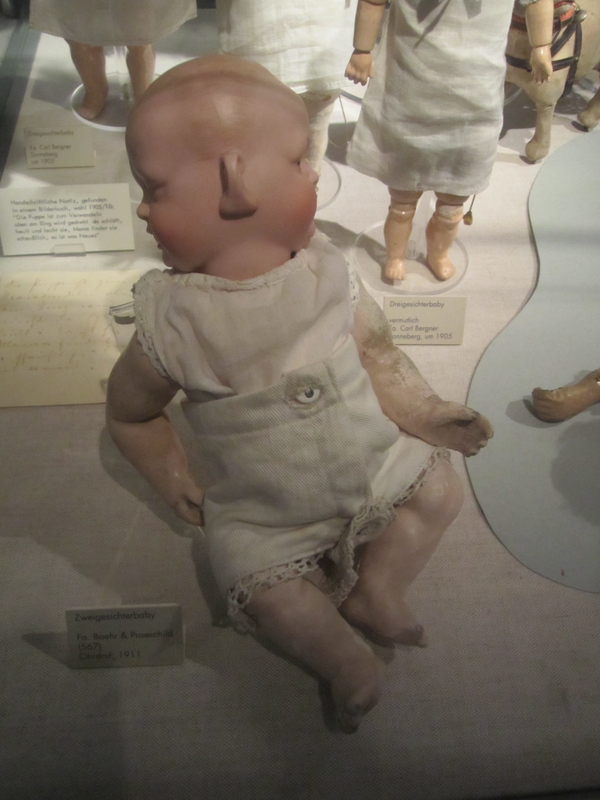 And I thought I’d share the weirdest thing I saw on the trip at the toy museum in Nuremberg. 2. Making new discoveries. In 2013, I started blogging, and it’s brought me new sources of inspiration, motivation, and connections with other people who share similar interests. Well, maybe for some of us it would qualify as an obsession rather than an interest. 3. Reaching new goals. I don’t need to say much here, but 2013 was the year I finally achieved my goal of doing a triathlon. I also keep realizing that I never posted my real race recap, so I’m going to try to do that before the weekend is over, because registration for the local Iron Girl races opens up next week! 4. Buying new clothes. Okay, this is kind of silly but when you lose 30+ pounds, nothing fits anymore. I have been piecing together a new wardrobe and just got my first box from Stitch Fix*, which was tons of fun. I read blog reviews of the box-o-clothes service before trying it out, so maybe I’ll post my own review even though this is hardly a fashion blog. 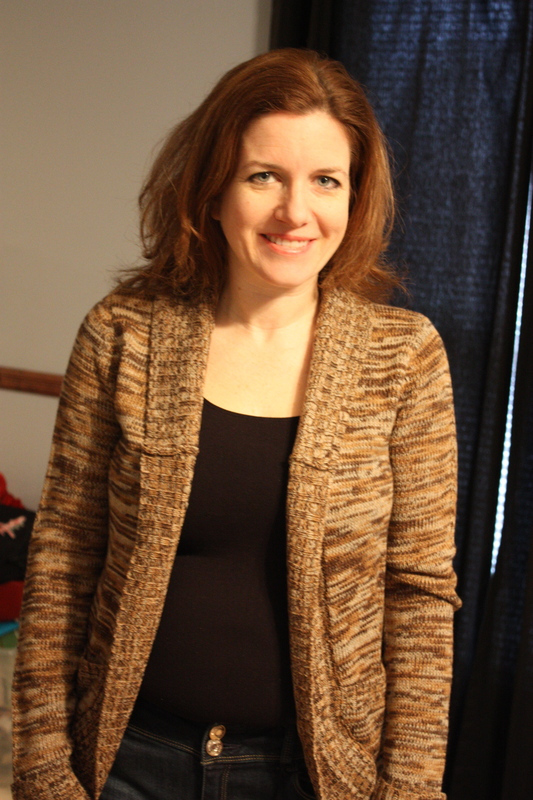 Maybe it would be considered the opposite of a fashion blog… but anyhow, here’s a sneak peek of a sweater I kept. I’ve also been having fun buying new workout clothes, some of which I am wearing in my weight loss “after” photos. 5. 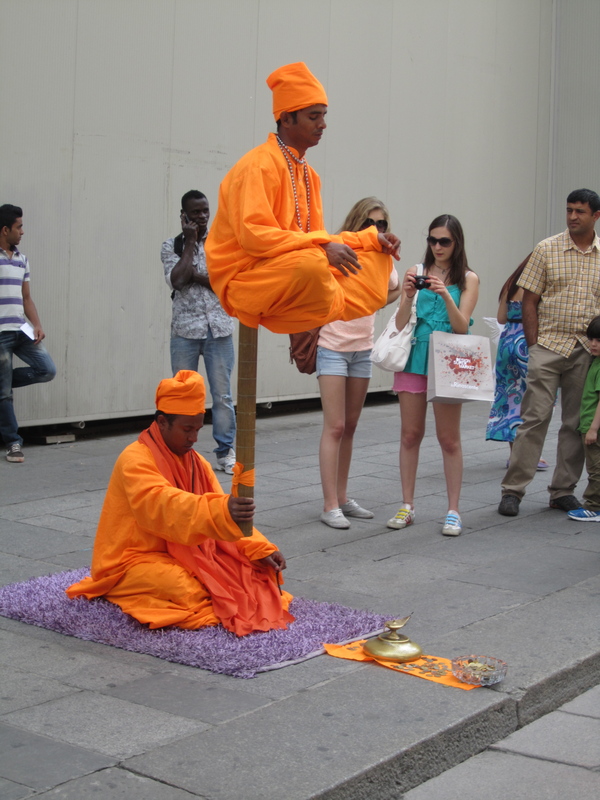 Finding new ways to balance. Throughout this year I’ve found ways to fit in exercise and training into my crazy life. One thing that has helped is to have an au pair live with us – no more racing around getting kids ready, fed, and out the door to daycare and school. I truly think that this has helped enable me to switch my workouts to mornings (most of the time), and to stay sane at home. Link up your Friday Five here! 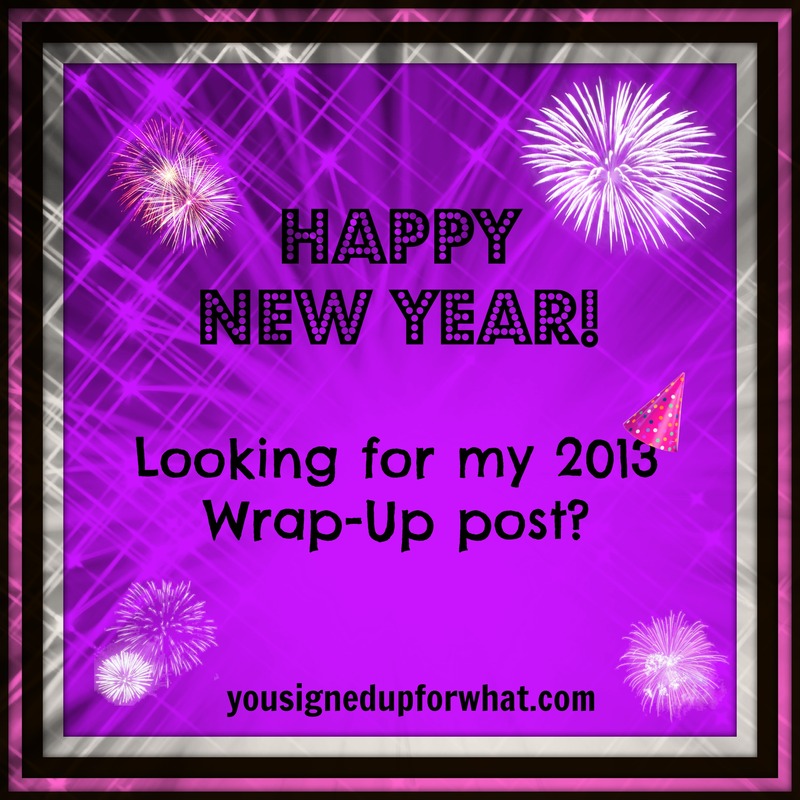 What are some new things that you did or learned in 2013? *To be out in the open – the link I posted to Stitch Fix contains a referral code, I’d get a referral credit if you signed up through my link. I’m in no way affiliated with them, I ordered the box on my own dime and gave another blogger a referral credit through my order. Feel free to use my link and give me a credit or just go through the main website. I can post a whole review of what I got in my box if people are curious! Posted on December 22, 2013 by Cynthia @ You Signed Up For WHAT?! 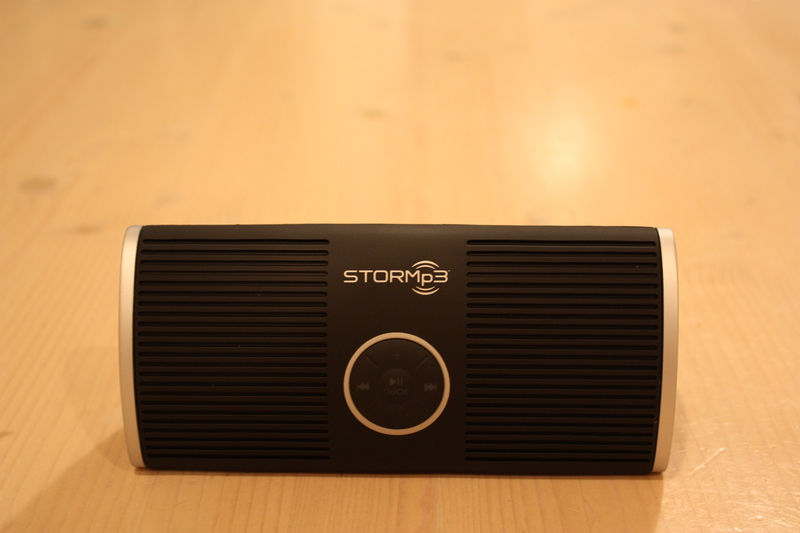 I’ve had some fun lately trying out a new toy – the STORMp3. 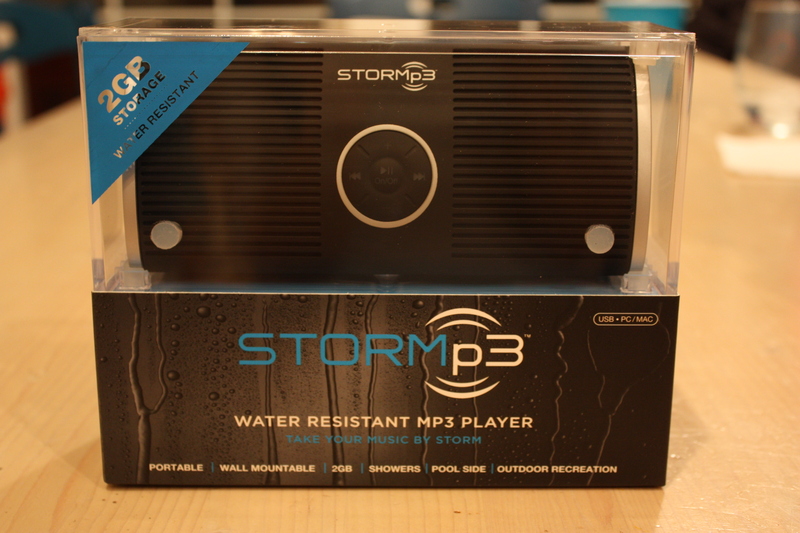 It’s a water-resistant MP3 player, and once I saw how small it is and heard the quality of sound coming out of it, I decided that little Mr. Storm and I have a future together. 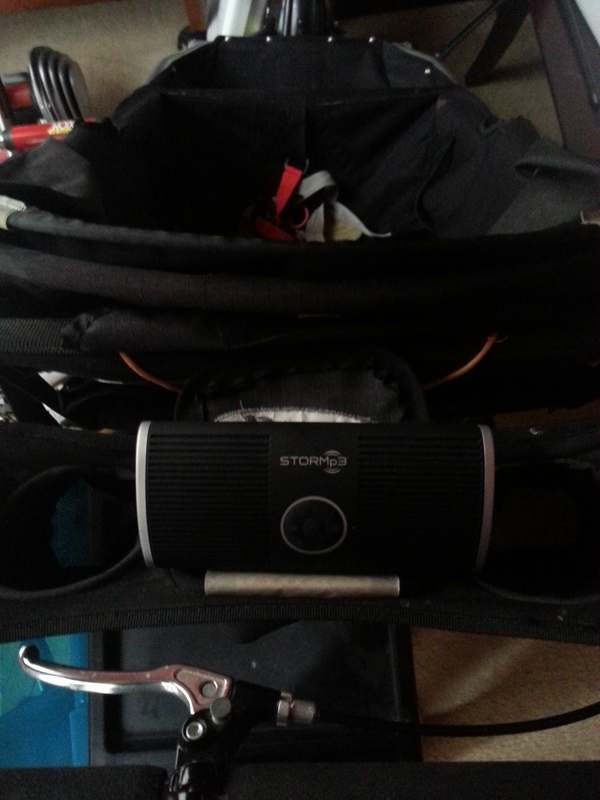 I’m making big plans dreaming up all the ways to incorporate this little speaker into my outdoor and indoor workouts. PACKAGING: It came packaged in a little plastic box that was easy to open – if packaging doesn’t result in me jabbing myself in the palm with scissors, it’s always a bonus. SETUP: Four AA batteries are included, thankfully, so I didn’t have to pilfer batteries from my kids’ toys. You just open the side battery compartment and pop them in. No screwdriver needed – there’s an easy twist-off for the battery compartment cover. I found it hard to see the positive/negative markings to see which way to put in the batteries – I had to shine a flashlight into the compartment. Some day I’ll memorize which battery connection points go with which end of the battery, but for now I suggest doing this in daylight or using a flashlight. It also comes with a USB cable, quick guide instructions, a wall moutning bracket and some adhesive. THE SIZE: I did not expect it to be this small – I loved the size and look of it! It easy fits in one hand so I can hold weights in the other hand to set up a workout, or carry a water bottle to the track. Here it is next to a Solo cup for comparison. CONNECTING TO THE COMPUTER: Easy. The USB connection is in the battery compartment, which makes sense to keep it protected from the elements. But seeing as how I’m a super-klutz, I put the batteries in first, turned the unit on its side to connect the USB, and the batteries came sliding out all over the floor – duh. Then I read that you don’t need to have batteries in it to sync with the computer. So do whatever works for you. But eventually I wanted to add more music to the player and had batteries in there, so the trick is to not turn it on its side. Not too hard, it’s small enough to just rest anywhere and it didn’t require a lot of effort to set up. The directions were very clear if you read them. The guide says a Stormp3 icon will appear on main screen for Mac users and a popup for PC users. I kept doing things before reading since there were only like 3 steps – so after connecting the USB I waited for a popup. No need – the STORMp3 icon just opens the Finder on a Mac, so you could just go straight to the Finder. ADDING MUSIC: This was so easy. It’s a drag-and-drop system, and it was way easier than I expected. I was worried it would require a lot of thought or effort, and I don’t have time to invest into learning a new system, so I was pleasantly surprised. It only took a second. I opened ITunes, clicked on a song, and dragged it over to the STORMp3 folder. It copied quickly, so I tried mutli-clicking on various songs and dragging them. No problem. In an instant I had a whole album copied. 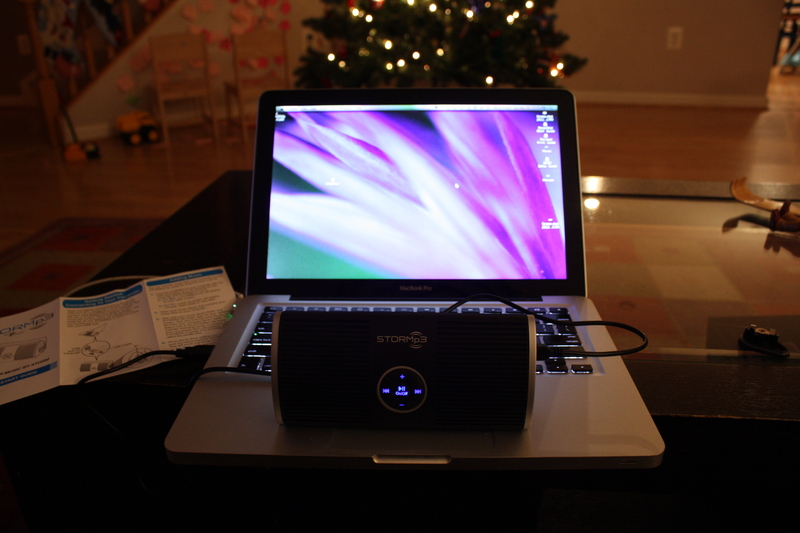 I ejected the STORMp3 and unplugged the USB cable, replaced the battery cover, and was good to go. PLAYING MUSIC: This was even easier – I just held the center on/off button and it started playing. Loudly. Oops, kids, you didn’t need to be sleeping right now, did you? 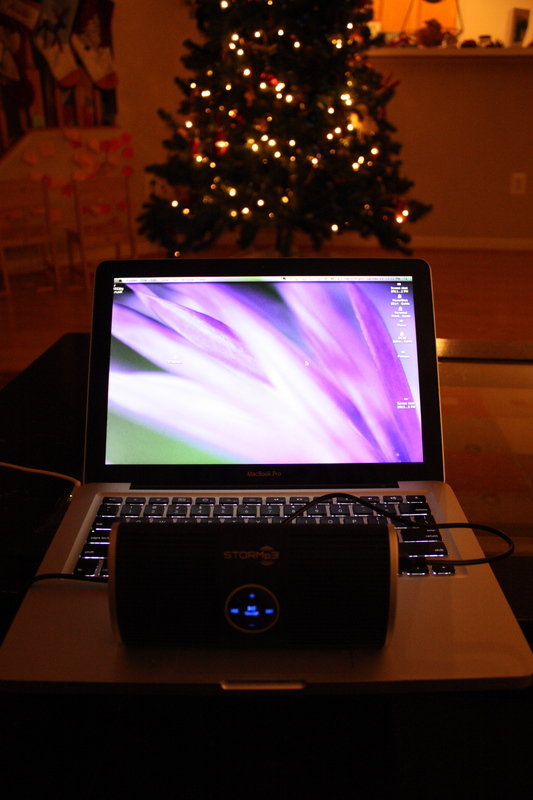 It was good to see that it has a good volume – my laptop never gets loud enough. I lowered the volume quickly – it’s very responsive. And the first thing I said was “wow, this sounds good!” I’m a musician so I was relieved to be able to honestly say I liked the sound quality! It’s really impressive. My only negative on the sound is that usually I prefer to balance with a bit more bass (it’s the former cellist in me! ), but the balance seems to be good for projecting through the noise of a shower or street noise so I can’t complain. WATER RESISTANT-NESS: Yep, I took this bad boy for a spin in my shower. The water seemed to roll right off of it, so I was happy it was water-resistant as promised. 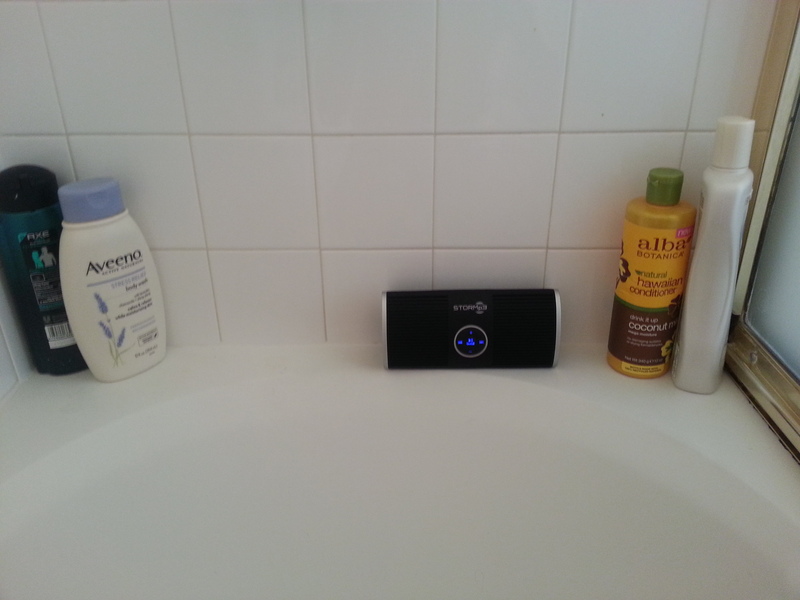 I loved the sound in the shower and while getting ready. 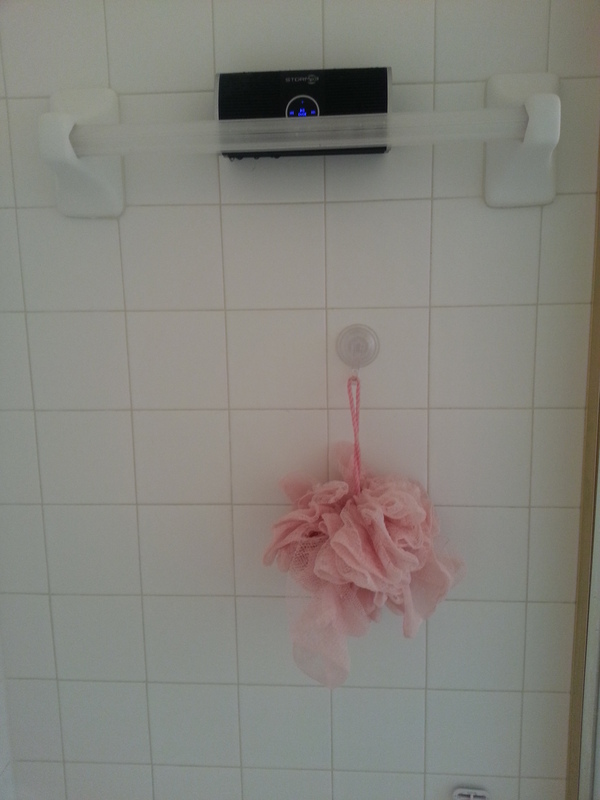 I had stopped taking my phone in the bathroom during my showers since a coworker had his phone ruined this way (condensation in the phone), so it was nice to have something designed for wet or steamy conditions. It’s water resistant and not waterproof, and a LOT of water was running all over it in the first place I put it, so I decided to move it higher. Just because I’m paranoid. I may mount it with the bracket, but it fits so nicely up there that I probably don’t need to use the adhesive and bracket system. The buttons were easy to press with wet hands because the rubber has a non-slippery texture. In my backpack pocket during a bike commute or long bike ride. By the pool for some tunes while swimming or playing in the water with the kids. In the backyard when playing with the kids or riding bikes in the alley behind our house. On our screened in porch where I can do planks and strength workouts. While on my bike trainer. At a track workout – my boot camp classes used to use music from a smartphone, but it didn’t project very well. This would be perfect. And last but not least – running with the stroller. I experimented with putting it on the handlebar console but thought it might take flight during a sharp turn. 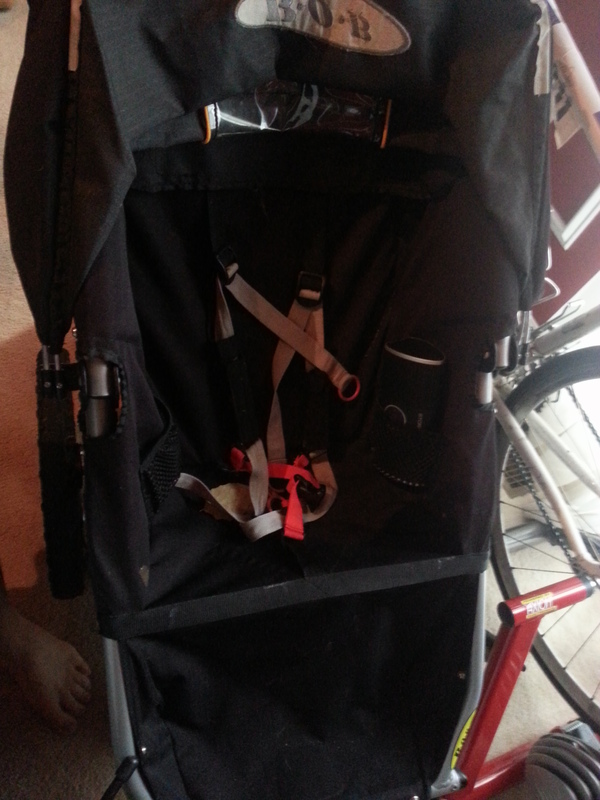 It would actually fit in the pockets of the console, but those are always in use with water bottles, sippy cups, or any number of pacifiers and other doodads for stroller runs. So I realized that it might come in handy for my son to listen to music while we’re running. I never give him my phone because I’m worried he’ll drop it and klutzy me will run over it, so a somewhat durable Mp3 player in the pocket where he won’t mess with it is a good solution for giving him some riding tunes. 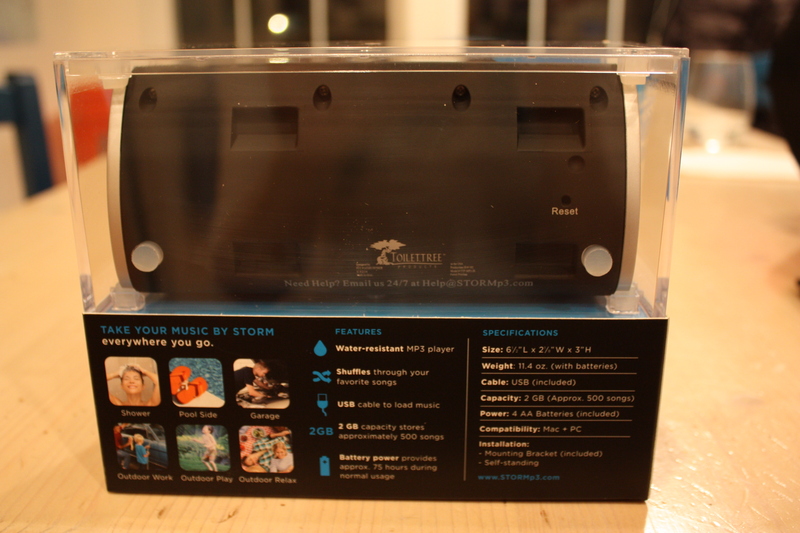 What makes our Water-Resistant Mp3 Player unique? Other portable music speakers cost over $200 and require a second source (ex. smartphone or computer) to stream music via a Bluetooth connection. 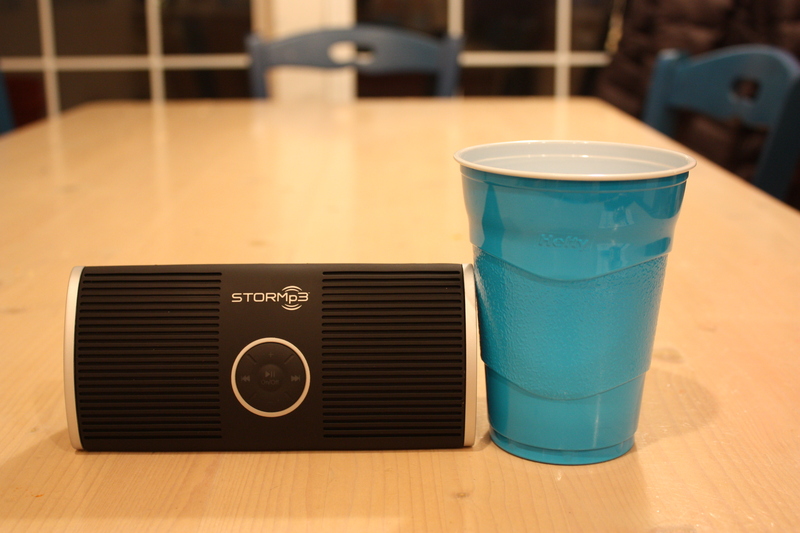 At a retail price of $99.95, STORMp3 (patent pending) will provide a booming speaker experience without the boundaries of water and Bluetooth technology. As you can see, I think it’s a neat little item, useful in many fitness situations, and it was way easier to use and way more portable than I expected. 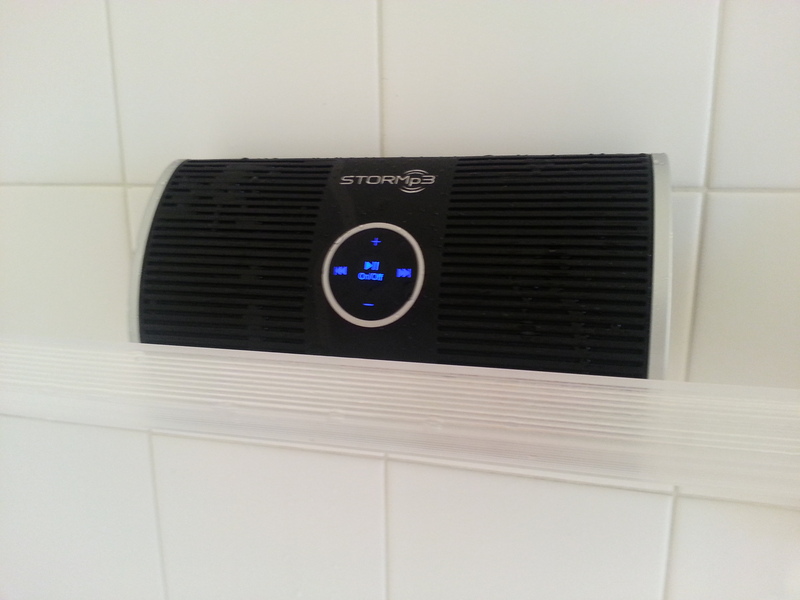 I loved the sound quality, although I wish I could boost the bass a little, the way it is balanced cut through the shower noise and would cut through street noise very well. 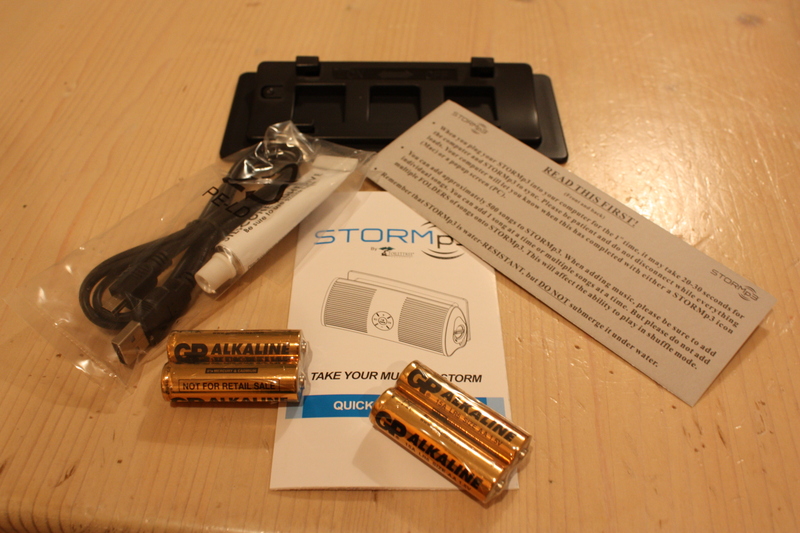 I recieved the STORMp3 in exchange for my review, and the opinions are my own. What?! A Way To Follow You Is This Little Button Here? What’s The Story? 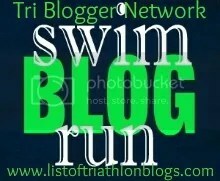 The Archives of Signing Up, Racing, and Signing Up Again?